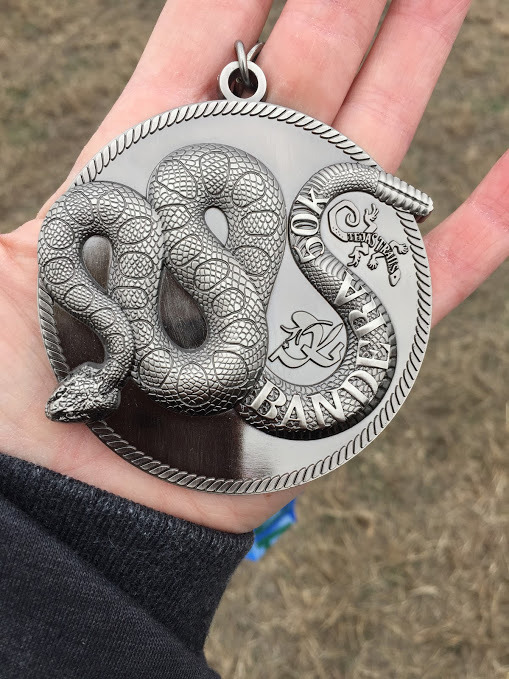 I finished the Bandera 50K in 5:44:17. I could’ve come in closer to 5 hours had I known what I was doing at the beginning. I started the race in the back half of the field. The trail at the Hill Country State Natural Area is a very technical single track trail, which makes it pretty hard to pass people. But I’m not concerned. I had a lot of fun and I’m happy with my performance. And that was the damn hardest thing I’ve ever done. Six hours of running is a lot of running. I hadn’t gotten all of my long runs in during this training period, but I did put in a lot of effort runs that really helped top off the mental fortitude. I ran 27 miles circumnavigating Lake Georgetown on the Goodwater Trail Loop. I ran 25 miles from the Decker Challenge half marathon back to my house, going through the greenbelt. I ran 21 miles in 20 degree weather without food or water over the Christmas break in West Des Moines. I ran a few other shorter distances during the break in single-digit temperatures. All of those helped in affirming that running is 90% mental. The other 10% is mental. The ultra marathon scene is so much different than the road running scene. Folks are so friendly, funny and outgoing. And I didn’t know it at the time, but I was sharing the trail with ultrarunning legends. Jim Walmsley was crewing for Cody Reed, who took 2nd place in the 100K and earned a Golden Ticket to the Western States Endurance Run. Camille Herron took the women’s 1st place and earned a Golden Ticket as well. Camille Herron also owns the record for the fastest 100 mile race at a breakneck average 7:38 pace. And she drinks beer during her ultras. At some point during the race I came upon an older gentleman in shorty shorts, no shirt, knees wrapped in blue and purple wraps, and lugging a water bottle that looked older than me and a plastic bread bag with some potatoes(?) in it. I really thought about running alongside him for a while and chatting because I was pretty sure that he’d have some stories to tell. He looked like he’d put more miles on his feet than I have in my 27 years of driving. But I was pretty set on gaining ground, so I didn’t chat with him. I think I might’ve said “howdy” as I ambled past him. I don’t recall if he said anything to me. Come to find out, that gentleman was Gordy Ainsleigh, the godfather of ultra running. Gordy was the first human to run the 100 miles of what is now the Western States Endurance Run through the mountains and valleys of the Sierra Nevada, and the most coveted ultra marathon. Gordy accomplished this feat of awesomeness in 1974 because he didn’t have a horse in the 3rd running of the race. The race used to be the Western States Trail Race and was originally a horse race with the goal to finish within 24 hours. On a horse. Ainsleigh ran the same course on foot, and came in within 24 hours. I ran next to that man this past Saturday. I have postpartum starstruckedness. It was a great weekend. Elise, Maly and Mara where there to see me cross the finish line. We’d arrived in Bandera the night before, grabbed Subway for dinner and picked up some food and sundries at the local grocery store, and hit the hay in our little cabin rental. 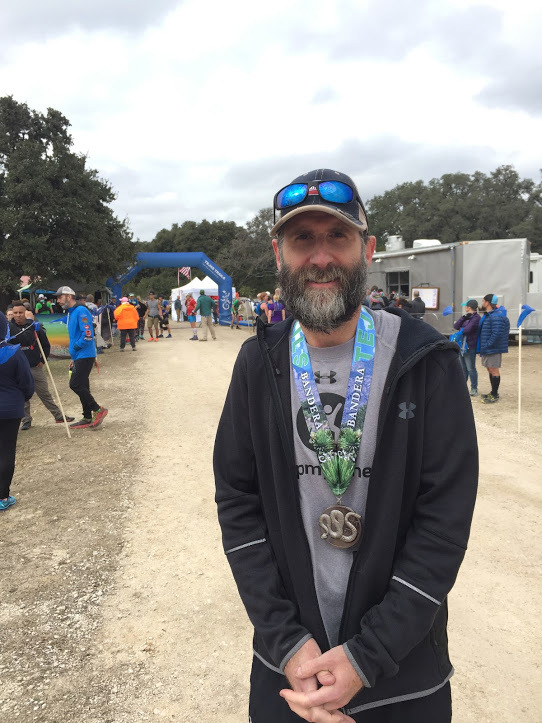 I woke up early on Saturday, did my morning pre-race ritual stuff, and drove out to the Hill Country State Natural Area and shivered for a half hour before the race started. After the race we drove back into Bandera and had lunch at the OST Restaurant with John. That was really awesome that he drove all the way out there to see us. It was a fun weekend. The race was hard as hell, but it was still fun, and that’s the important part.